Doe's any on here have one or used one? Looks like you could make it into a good wee arbtruck. Any info on them would be gratefully received as i fancy buying one. Tiny cabs, terrible off road(and by off road i mean dry hard grass), but well built and reliable trucks. Carries the weight very well. if you have a tow bar make sure there is somewhere for the spare tyre. Recalled after 2 years for steering damper modification, Isuzu letter said it was free of charge main dealer wanted to charge. Is any of the small tippers better than it then as far as price and economy, and thanks for your answers it's good to hear from someone that's experienced one of them. Tidy back on yours john where did you get it done, cheers for your reply. We have a 58 plate. Awsome power, turning circle and load carrying. I think they forgot to add comfort and space in the cab, aithough there is a wide cab option. The bouncy ride is unreal. Any uneven road surface at over 25mph will see everything not tied down on the floor or driver. For extra comedy value try putting things in the overhead compartments and see how long they stay there, could be dangerous to the unwary driver. Had three recalls, free fix but still truck off road- and talking of off road the Grafter will get stuck on a wet tarmac road unladen with a moderate incline. I am not joking. O and lumpy gear change but ok when you get used to it. 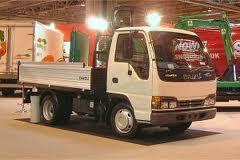 If I had to choose again I would get a transit or Iveco but I would really miss the turning circle.